Cloning Service for Electronic Steering Lock Module (located under the steering column), which is part of the vehicle's Immobilizer System. Common failure item on Porsche Cayenne, VW Touareg/Phaeton and Audi A8 vehicles. Steering Lock issue is typically identified by no start and no response from key in the ignition, or proximity access (Start button). Cloning Service covers configuration/identity cloning from your existing Steering Lock Module to a Donor Module (Provided by the Customer) and bench testing. Steering Lock module can be separated from the Steering Column. Please contact us for instructions. By dealer standard, the Module itself is not a serviceable item, which means that the dealer will want replace the entire steering column (which the Lock Module is part of) and in some cases the Access Start Authorization/ Immobilizer Control Module. 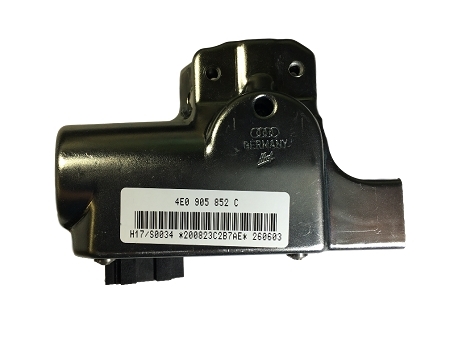 Requires shipping of Immobilizer components (Original Steering Lock Module, Donor Steering Lock Module, Access Start Authorization (Immobilizer) Control Unit - (also referred to as a Kessy), and one Key). SpeedometerSolutions is not affiliated with Volkswagen AG (and its subsidiaries), BMW AG, Daimler AG or any other automotive manufacturer. Manufacturer names, models and part numbers are used only for identification purposes. All make/model names, logos, are trademarks are registered trademarks of their respective owners. Copyright Speedometer Solutions. All Rights Reserved. eCommerce Software by 3dcart.